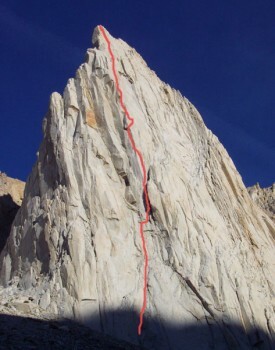 Positive Vibrations is possibly the best rock climb in the High Sierra. It takes a proud line up a ridiculously exposed prow in the center of the face. The rock quality is exceptional and the climbing is unrelenting with the first eight pitches rated 5.10 or harder. The has an even balance of finger and hand cracks with no wide sections. It feels about as hard as Yosemite's Rostrum but is longer and more committing. Which SuperTopo guidebooks include a topo for Positive Vibrations?